Samsung Galaxi Spica is the first Android phone was launched Samsung. Candybar phone with a fairly thin shape with 1.3 cm in size was decorated with a wide touch screen that dominates the front side. Right below the screen, there is the navigation buttons shaped like a diamond and on the left hand corner there is also Google Search plus the menu button and call button. Then, on the far right corner there is the home button, Back, and the power button. But all the buttons are not equipped with a backlight, so in dark conditions would be less troublesome users. Android System 1.5 (cupcake) supported with 3.2-inch diagonal touch screen, 65 thousand colors, a resolution of 320 x 480, and attached accelerometer. In part this has been using the phone's screen AMOLED display, so it looks sharper look at the same time can save the battery. But when are outdoors decrease because the sharpness of the screen in direct sunlight. Samsung's Galaxi Spica display interface is no different Android OS 1.5 based smartphones such as HTC Dream and HTC Magic. On initial display consists of three buttons that can be added to home screen widgets or the shortcut menu. To access the main menu bar the user to stay pressing triangle symbols contained in the lower corner of the screen. However, for typing the user data input can only use the virtual QWERTY keyboard on the screen, but the response is not accurate when compared with Motorola Milestone or Google Nexus One. Network: GSM 850/900/1800/1900, HSDPA 900/2100. Dimensions: 11.5 x 5.7 x 1.29 cm. Screen: 3.2 inch, TFT Capacitive Touchscreen, 65K colors (320 x 480 pixels). OS: Android OS 1.5 (cupcake), 800 Mhz processor. Features: Accelerometer, Screen Unlock Pattern, Google Maps, Google Mail, your Google Talk, Google Search, Facebook for Android, Divx Player, YouTube. Pros: HSDPA, GPS, WiFi, the Android OS 1.5, 800 Mhz processor. Disadvantages: The camera is less optimal, minimal application, not equipped with the Android Market, Without the video call. For those who have a hobby of blogging using Wordpress with Blackberry phones, would be facilitated. 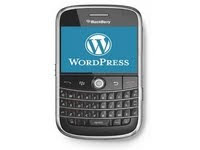 Because now there are special applications made Wordpress for BlackBerry users. Facilities on offer are also not inferior to the PC version. With this Blackberry users can write blog posts, upload photos and videos, edit and organize pages of comments on each posting articles into wordpress. For Blackberry users, the application is already supported platform Wordpress version 2.7 site up and special selft-hosted. If the user wants to obtain more complete information about Wordpress application usage, and trouble shooting can visit the forum here. Samsung W960 AMOLED, Mobile TV With 3D Screen. Samsung W960 3D AMOLED is expected to enter the Indonesian market in the third quarter. Samsung W960 AMOLED display has the ability to convert 2D into 3D in real time. Users are also provided convenience for watching 3D TV channel, using the application of DMB TV. Network: Tri-band GSM and HSDPA. Dimensions: 11.39 x 5.39 x 1.39 cm. Screen: 3D AMOLED capacitive touchscreen, 16M colors, 240 x 400 pixels, 3.2-inch. Camera: 3.2 Megapixel, 2048 x 1536 pixels, Auto focus, Video. External Memory: microSD up to 16 GB. Data Transfer: GPRS Class 10, EDGE Class 10, 3G HSDPA / HSUPA. Connectivity: Bluetooth v2.1 with A2DP, microUSB v2.0. Messaging: SMS (threaded view), MMS, Email. Other Features: Accelerometer sensor for UI Auto-rotate, Gesture control, Turn-to-mute, Touch Wiz 2.0 UI, Games, Java DMB TV, MP4/H.264/H.263 player, MP3/WAV/eAAC+ player, Organizer, Document viewer (Word, Excel, Powerpoint, PDF), Voice memo, T9. Battery: Standard battery, Li-Ion 1150 mAh. HT G78, QWERTY Phone With Three SIM Card and TV. HT G78 is a mobile phone innovation for G75 series that uses a technology triple-on, with dual on GSM plus CDMA. This phone is more interesting than the G75 which uses a triple-on GSM. The concept of the body a little different than most QWERTY phones, mobile phone HT G78 looks more broadly with the texture of the keypad is more comfortable when used for typing. This phone also has adopted features an analog TV tunner, which is an additional facility to watch live World Cup. For chat facility, HT G78 has also installed cameras video chat although only VGA resolution. Screen: TFT 262,144 color, 2.46-inch, 320 x 240 pixels. Dimensions: 11.4 x 6.2 x 1.39 cm. Connectivity: EDGE support, GPRS class 12, Bluetooth with A2DP, Data Cable. Feature: Java, Trackpad, MTK 6235, OperaMini, Jack 3.5 mm audio, analog TV Tunner, Facebook, Twitter, mig33, eBuddy, Snaptu, VuClip, Wapedia, FM radio recording, E-Book reader, call Sound recording, Background sound, Dictionary, Call blacklist, video chat, a photo editor. Pros: Triple-on (GSM-GSM-CDMA), TV Tunner, Java multitasking, Dual camera, video chat, Call recording. Disadvantages: VGA camera, not wide screen, TV tunner less good.